Paper Sweeties April Release Party! Edited: thank you to Linda at Catered Crop for choosing my card as one of the winners for last week’s ‘Think Green‘ challenge! I began by stamping an image from the Borders stamp set at the top of my cardstock base and the added a couple of pretty patterned papers in stripes and polka dots – YUM! 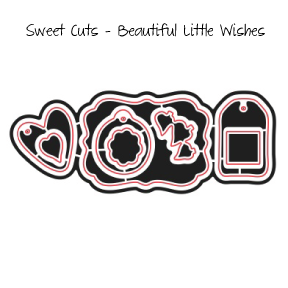 I die cut five tiny hearts using the Beautiful Little Wishes Sweet Cuts die and popped them up using dimensionals before adding to my card. I stamped the polka dot frame and ‘Celebrate’ sentiment using the Beautiful stamp set and then die cut is using the Beautiful Little Wishes Sweet Cuts die! I stamped a sweet little banner sentiment using the Happy Everything stamp set and adhered it to a trinket pin. The bunny is a shrinky dink image that I shrunk down using my heat gun … so FUN! I finished my card by adding a strip of pink & white gingham washi tape, Raspberry Baker’s Twine and three sweet Raspberry Sequins! 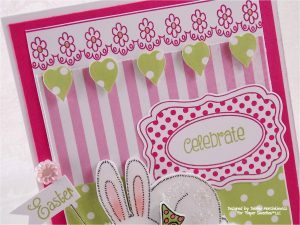 Play along with the April inspiration challenge for a chance to win a shopping spree in the Paper Sweeties shop along with a Guest Designer invitation to join us for the next challenge! We’ve added some complimentary digital images to the site for you to try out in case you don’t own any Paper Sweeties stamps yet! 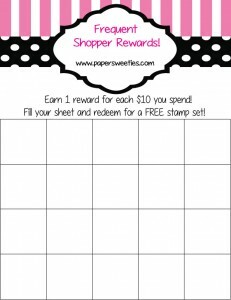 Have you checked out our new FREQUENT SHOPPER REWARDS Program — check out all the details on how you can earn free stamps when you order goodies from the Paper Sweeties boutique! ‘LIKE’ us on our Facebook Fan Page … we LOVE making new friends! I’ll be back again tomorrow along with the Sweeties Teamies and we will be sharing some more adorable projects for the April Release Rewind wrap up … come on back for some more FUN inspiration See you soon!! Paper Sweeties April Release Countdown! Paper Sweeties April Release Rewind! Debbie I love this adorable card!! The colors ooze spring and that bunny is just too CUTE!! Your card is darling!! Wow, love the colours and the fabby details!!! Great card 🙂 It is so cute and adorable. How stinkin’ cute! I adore his fluffy little tail. 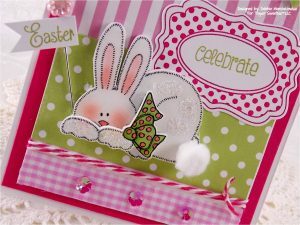 Such a cute and fun card – love the colours you used with this one as well. Thank you for joining in our challenge at House of Cards this fortnight. Adorable card, I love the colors and your gorgeous papers! Thanks so much for joining us at HOC! 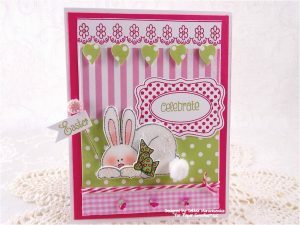 Love the cute bunny and your color choices! Thanks for joining us at House of Cards! Such a sweet and pretty card! Thanks for joining us at Fusion! Aww, this is just adorable! I love the little banner you made with the pin. Thanks for sharing at House of Cards. 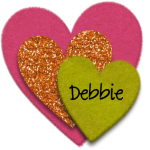 OMG Debbie- Super adorable!! I have to ask where you found the bunny shrinky dink?? I want one 🙂 Love it! Super darling debbie! I love her sweet tail!